Let's see how Michael Jordan and Larry Bird do with this hoops game. Off the pinball flipper, past the saw blades, through the portals, nothing but net. That's Gasketball, a fun and at times maddening sports game from (guess who designed it) Mikengreg. 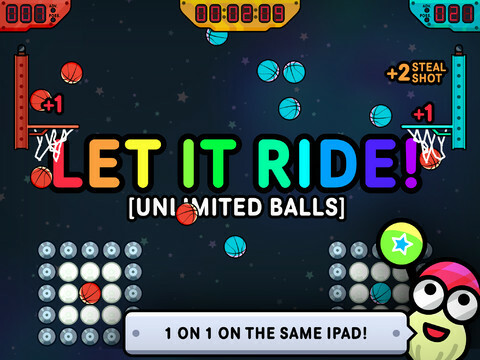 Free-to-play, challenging and cool, it's one of the more unique takes on hoops we've seen for iPad. That said, it does require a basic understanding of geometry, so get ready to work those angles. 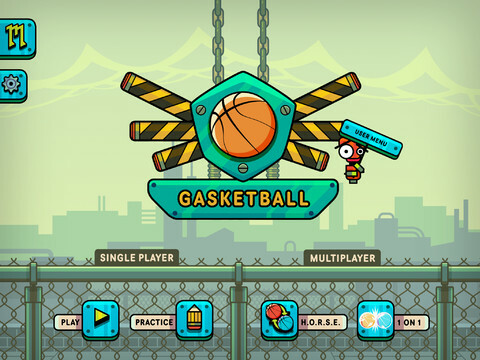 Each level in Gasketball tasks you with making a crazy shot by dragging, flicking and bouncing a ball, more often than not off one or more objects. In some cases, a tiny robot (think of it as a virtual companion) will take the shot to show exactly what needs to be done, but most times, you're on your own. Thankfully, the developers offer a guide of sorts by highlighting the first object you'll need to hit in order to complete the basket, and this runs the proverbial gamut, from an arrow that sends the ball flying in a specific direction to walls, pinball flippers and even portals clearly inspired by Valve's Portal series; still no cake, we're afraid. On that note, you're free to take an infinite number of attempts, but you won't earn a score or star rating unless make the shot using five balls or less, no easy feat, since the puzzles grow increasingly difficult. Not only must you contend with basic physics and geometry, but also hazards like those aforementioned blades that chop the ball in half, but therein lies the beauty of Gasketball. Sometimes, the solution isn't as complex as you think. With this in mind, the game offers a handful of levels for free, with the option to buy individual level packs for $0.99 apiece or an all-encompassing unlock that costs $2.99. The latter is by far the best deal, as it not only grants access to every available content pack, but future ones as well; there are at least four level packs in the works. Meanwhile, you'll find two multiplayer modes. The First, 1 On 1, is an offline mini-game for two people to see who can make the most baskets across a handful of tricky stages. H.O.R.S.E., on the other hand, lets you create a shot, make it and then challenge another person online to do the same in asynchronous fashion. This mode, while cool, only serves to highlight one of Gasketball's biggest omissions, that being the ability to create a shot from scratch and share it with the rest of the world outside of H.O.R.S.E. What makes this even worse is the fact that the developers tease you with a practice mode that lets you complete the first part, but from there, you just play with yourself. This, however, is but a small complaint about an otherwise excellent game. 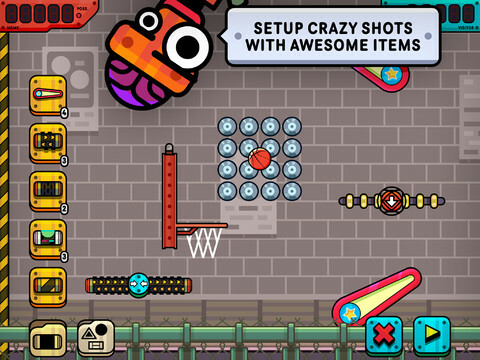 Gasketball is an entertaining sports title that'll leave you scratching your head, figuring out the best ways to make a seemingly impossible shot. There's not much to do playing it for free, so we suggest parting with three bucks to score the whole shebang. You'll thank us later. What's Hot: Cool take on making trick shots, in-depth practice mode, clean and colorful presentation, excellent physics, asynchronous H.O.R.S.E. mode, $2.99 unlocks a whole mess of content. What's Not: You can't share levels with people from around the world outside of H.O.R.S.E., level selection/navigation is a bit strange.